When it comes to being on a schedule just possessing a wall clock or a wristwatch shall not help. You must be buying these gadgets with an intention to be on time each day. One of the most eminent names in the field of weird watches is Tokyoflash. Tokyoflash is unique because of its designs are unique and at times it seems to be impossible to use. Though there are many such. 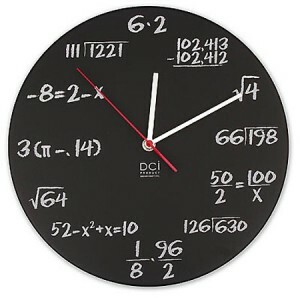 Math Clock is a clock which is offered by ThinkGeek. It is a wall piece which from a distance appears to be quite OK but it does possess a complicated feature which would require not only a quick glimpse. The design on the front plate is the only difference. There are numbers, but some math exercises are required in order to exactly know what the time is. The mathematical formulas and equations replace the Arab numbers and Roman symbols. Rather than these formulas and equations the exact numbers should have been printed in its place. 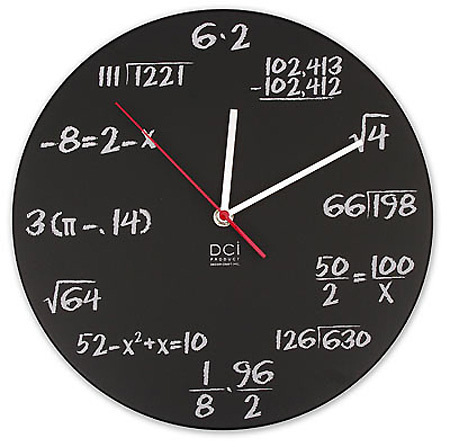 For example, the inventors of the Math Clock thought that rather than simply writing down “9” they replaced it with the “3(Pi-0.14)”, and “7” is written as “52-x2+x=10”, etc. Though this clock is interesting and unique but I am scared that there shall be difficulty in teaching a child how to read this particular. This clock is available for 27 bucks. And this tool shall be useful only for the intellectuals. It can be a wonderful and unique gift fro your friends so go ahead spend the 27 bucks. Should Mobile Phones Carry Health Warning?